Your IP address is like your phone number for your Internet connection. Using commonly available techniques, hackers, data thieves, and companies can use tools or cross reference databases to accurately determinate more information about your identity from your IP address. 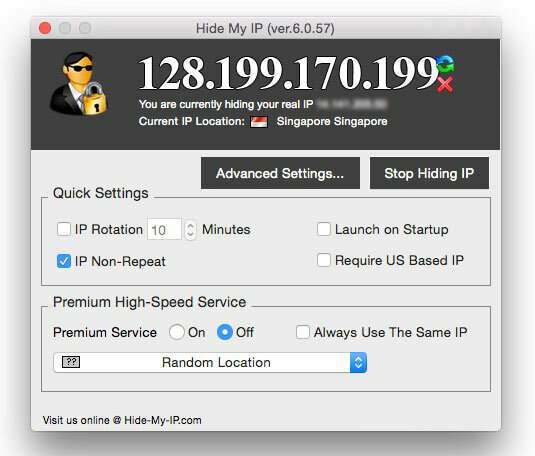 Hide My IP is a must-have VPN tool for the privacy conscious. Using Hide My IP is a bit like caller ID blocking for your IP, preventing websites, apps, and anyone on the Internet from knowing your true IP and identity. Hide My IP exclusively uses the most secure VPN protocol ñ OpenVPN with 256-bit encryption. This means all your Internet traffic and activity is fully encrypted. Not even your ISP or government can know which websites you visit or monitor or record your web traffic data while the software is running. Most people who travel outside their home country are aware that Internet availability is different in each country. Some countries block sites like Twitter, Facebook, and YouTube. Some websites such as BBC iPlayer, Pandora, and Netflix are not available in most countries. Adult websites are blocked in various countries by ISPs or countrty level network censorship – Hide My IP is able to easily unblock these types of sites by using an IP from a country with more Internet freedom such as a US or UK IP address. 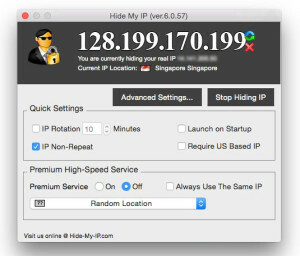 Hide My IP enables users living or travelling in various countries to change their IP location from more than 75 locations across the globe, thus enabling access to any blocked website. For some situations, using a proxy VPN such as Hide My IP can help boost your connection speed and stability. If your Internet Service Provider is on a network with routing issues, you may notice slowness or an unstable Internet connection. This type of issue is more common for developing countries. Hide My IP can improve your Internet traffic routing, causing an alternate path to be used to access a website, and possibly allowing the website to load faster and more reliably. When sending E-mail, your IP address is usually visible to the world, which enables any recipient to see your location and possibly access other details regarding you. However, Hide My IP can conceal your IP from your E-mail headers, thus allowing you to send anonymous E-mails. Masking your IP in E-mails can also help protect you against targeted attacks based on your E-mail IP address. 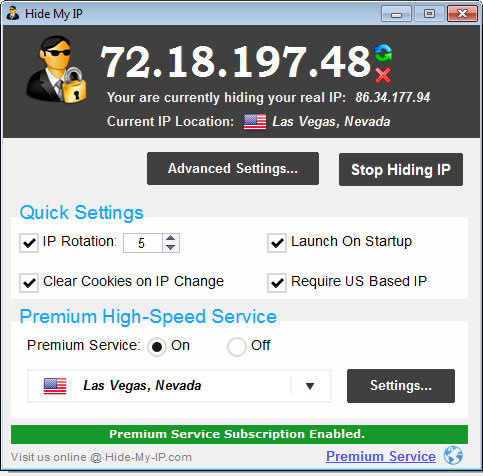 Hide My IP is provided for free on Windows, Mac, and Android devices. Good news for Android users, Hide My IP is completely free for Android versions 4.0 and higher, no root access needed, the only limit is the number of IP locations users can choose unless a full license is purchased. Hide My IP VPN accounts may be manually configured on other devices such as iPhone, iPad, and routers that support OpenVPN configuration. Hide My IP may be used indefinitely after a one time purchase of $29.95 or as low as $2.95/month when purchased from Google Play.